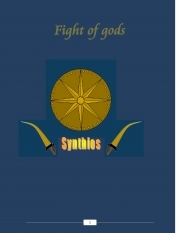 Synthios is a hero of greece who loses his parents and has a great upcoming battle coming up. Will he be able to fight a god and get his revenge? Read on. Manhar Gupta(1998- ) is a student of Sri Kumarans Childrens Home (CBSE). He has a passion of reading and writing books. He is said to be writing a book 'Jack Allen'.